So in April, my birthday month, we traveled to Tokyo, Japan for Uncle Keith's wedding. The whole BibAni clan went including Nenek Rose, Aunty Fira and Uncle Yan. Tok Abah encountered some problems at the airport when we took off so he had to take another flight the next day. Once we arrived, we left our bags at the hotel and went straight out for sightseeing. The weather was nice and cool. The first place we visited was the Sensoji Temple. It was the end of the Sakura season but we managed to catch some of it. Mommy and dadda bought some cool souvenirs from there. We also had help from 2 cool guides, Nakano-San and An-San. Photo session with the guides before they leave. Uguisudani station, the nearest station from our hotel. You can see our hotel at the background, Candeo hotel. We walked for a bit more until it was time to check into the hotel. Then, we just rested for the rest of the day. The next day, Tok Mama and Adida went out early in the morning to fetch Tok Abah from the airport. We also got ready early and met up with them at the station where we had breakfast and waited for everyone else to come. After brunch, we browsed at the Ueno station and walked across the road to Ameyoko while waiting for the Franklins to arrive. When everyone showed up, we went for a snack at the Ueno Park just a few minutes walk from the station. Pak Su with lil' Aaron - Aaron's first trip overseas. Tok Abah and Tok Mama with all 3 of their grandchildren in front of Hard Rock Cafe. Picnic in the park with the Franklins. After our outdoor activity at the park, the Franklins had to leave to meet up with the bride and her family. Us kids followed Tok Abah and Tok Mama back to the hotel to rest since Tok Abah practically disembarked from the plane straight to sightseeing with us. The rest of them went on to Akihabara for some shopping. The 3rd day was THE day. We got up real early that morning and dressed up. New Otani Hotel, where the wedding was held. Uncle Keith married Rie in a beautiful ceremony in a fancy hotel in Tokyo. We had a whole table to ourselves and I experimented with Japanese food there. Surprisingly, they tasted great. I quite like it. Idzhar also made a new friend with Uncle Keith's nephew, Oscar (he calls him 'Ostar'). Everyone in our family wore our costumes from Pak Su's wedding except for me. I had on a new outfit. Dadda bought Olaf at the Ueno station and since then Idzhar won't go anywhere without it. The flower girls and page boys - all Uncle Keith's nephews and nieces. 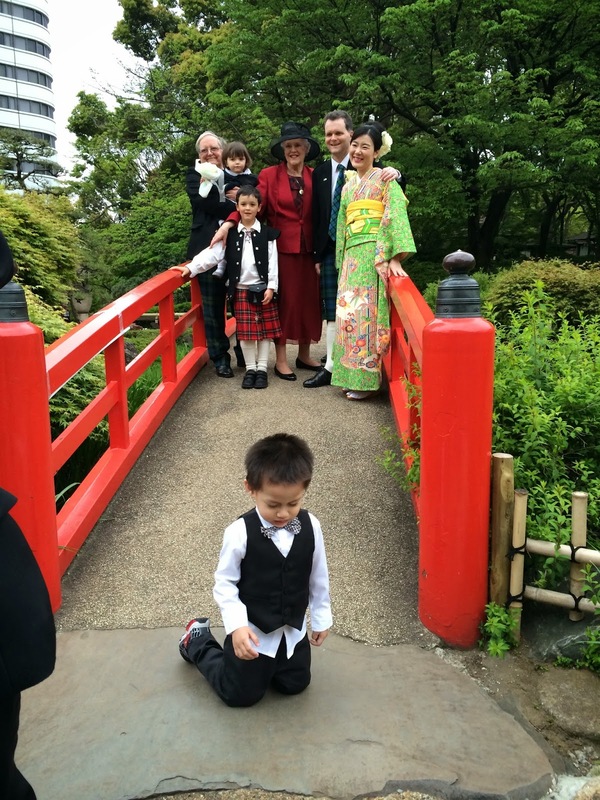 Uncle Keith wore the Kilt and Rie wore a nice white dress and changed into her traditional Kimono after lunch. 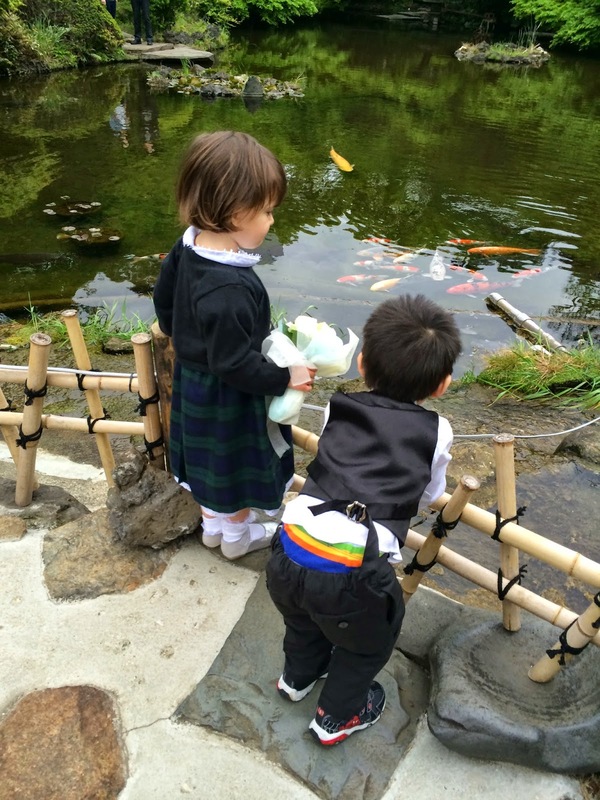 A few others were also in Kilts and other traditional costumes. We all had our own place at the table and it was all named. Even Idzhar had his own place. It was really thoughtful of them to prepare Halal food and non-alcoholic beverages for us . After lunch, everyone proceeded outside to the garden for some photo session. We took turns taking photos with the bride and groom and then went on to take our own photos. The hotel had a really nice garden and ponds with large Koi fish. Photo session in the hotel garden. The wedding didn't end there though. After the photo session, we all changed into something more casual and walked to a cafe/bar for the after party. Tok Abah, Tok Mama, Idzhar and I took the taxi. At the party, we got to mingle, talk and take more photos with the bride and groom, the Franklins and other guests. Changed into their party outfits. Before we went back to the hotel, we took one photo with everyone and then proceeded to take the train back to the hotel. It was an exciting experience for all of us and we went home exhausted but happy and glad. The 4th day was my favourite day and I consider it as my birthday present. Hi, I came across your blog and I enjoyed reading your amazing stories. Interested to collaborate ? Email me at nurul.aini@zalora.com.my. Hope to hear soon. Thanks!